Sometimes called oreo truffles, these oreo balls are rich, decadent, and use only 3 ingredients! 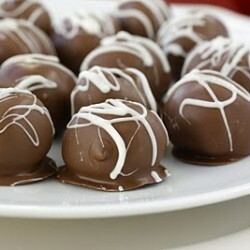 These oreo balls (sometimes called oreo truffles) are amazing. There’s really no other way to describe them. A soft, rich, fudgy center surrounded by a thin chocolate coating – this is one Christmas cookie tradition we can’t do without. To make them you crush a package of oreos in a food processor, mix with a softened block of cream cheese, roll into balls, and dip into melted chocolate. And that’s it! You have then produced the most wonderfully rich, chocolatey cookie you’ll ever taste. If you haven’t tried these oreo truffles yet, you are missing out. They are a family favorite and one that we make every year for Christmas. Enjoy!! Crush oreos in food processor. Combine crushed oreos and softened cream cheese in a large bowl. (Your hands work best for this). Roll into 1-inch balls. Using a toothpick, dip the oreo balls into the chocolate, letting the excess chocolate drip off. Set the oreo balls on waxed paper to cool. Store in the refrigerator. Don't use double stuffed oreos because they tend to make the oreo balls too soft. If you do use double stuffed oreos (such as the mint creme ones), you can refrigerate the balls to make them easier to dip in the chocolate. 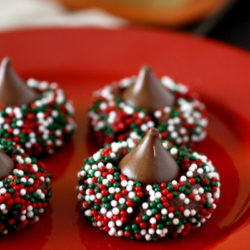 To make the chocolate drizzles to make them look nice, melt a contrasting color of chocolate. Dip your spoon in the melted chocolate, let most of it run off, and then kind of shake it over top of the oreo balls. I love them covered in white chocolate! kilax – I hope your mother likes them! Thanks Megan! Some one from our office made these last year and I never got the recipe. These will be a big hit in our family. 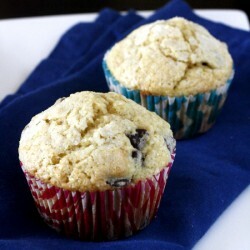 Those look soooo good. I saw another blogger making these recently as well! thanks for the blog visit–i'm so glad you dropped by, because these cookies look insanely delicious! looking forward to seeing what else you whip up! yum! we are making these this year! and the pictures are incredible!!!!! i LOVE that new camera of yours! Are you serious? These can not be this simple! They look absolutely AMAZING! Thanks for sharing! How do you store them? Fridge? There really is no other way to describe these other than amazing!!! Hey Afton! I bet they'll turn out great. And i"m sure Matt will appreciate it 🙂 Good luck! Let me know how it goes. Great and fun idea of a cookie for all ages. I had better luck mixing the crumb and cream cheese together in my food processor vs by hand. My yield was 50 balls. Thanks for sharing your recipe! happy Holidays. Hey, this recipe sounds great, just wanted to ask: how many oreos are in the package you use? Hind – I've never counted, but it is just a standard package of oreos. 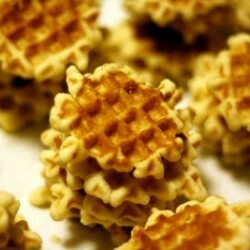 I have made these with white chocolate before and everybody loved them. You just can't go wrong with Oreos! Yum. OMG these are to die for!! I made them last night to add to my cookie tray and I'm so glad I did!! They are like little oreo cheesecake bites…so delicious! And rich!! I had some vanilla candy melts left over from a cake I had done, so I used those to coat and then used mini choco chips sprinkled on top as you did in your cookie dough bite balls. They look so cute and taste even better. I love your blog and will be making more and more goodies from it!! Thanks so much! Love your site. I had a question about the oreo balls – how far in advance do you think you could make them? I am planning a cocktail party and these would work really well, and am trying to budget how much time I need to make everything. Thanks in advance! Hi Megan! 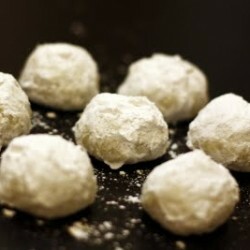 I love this idea and will be making a batch of these oreo balls this weekend. I know it says to refrigerate… I was hoping to take them to the office packaged in little treat bags as gifts though.. do you think they would be okay out of the fridge for awhile? Will they melt and turn gooey? Unbelievably good! Thanks for the recipe. We ate them all before coating them in chocolate, they were just that delicious! Maybe next time we’ll get them in chocolate. Thanks for the recipe! We’re trying the peppermint marshmallows tomorrow! I’m glad you liked them! 🙂 I hope the marshmallows turned out well! Hey Megan – just wanted to stop by and say my friends loved these Oreo balls! They didn’t believe they were made by hand, lol. I know this recipe is all over the web, but I first found out about them here, so I have you to thank. 🙂 Love your website and the lovely pictures that help teach beginners like me how to recreate your beautiful treats. Just wondering what kind of chocolate discs you used? What type of chocolate would you suggest? Semi-Sweet or Milk? Hi, Megan! You have inspired me to make a cookie themed gift for my friends using your cookie dough bites and Oreo balls recipe (both look FANTASTIC!). I’m making 6 boxes and I want each to contain 8 Oreo balls. Would you suggest doubling the recipe? And about how big should I roll them? I made these to give to all the teachers (I made over 200)….and they were delicious!! And very well received. People couldn’t believe that they were homemade. Thanks so much!! Just made these and they turned out great! I added a little peppermint extract to the dipping chocolate and it was delicious! Thanks for the recipe! I’m so glad you liked them! Great idea on the peppermint extract – I never thought to do that! These are AWESOME! My lil’ ladies and I made original, mint, and berry creme oreo balls today. The berry creme were over-the-top-mom-do-these-have-go-on-the-gift-trays-we-want-to keep-them-all-to-ourselves-good! Thanks so much for a fun, easy, delicous recipe! My girls will be asking for em all year round, I am sure! Did you know that Kraft has another way of doing these? You mix 1 package of instant chocolate pudding with 1/2 cup cold milk for about 2 minutes. You mix that into the crushed up oreos, (36 which is almost the whole package minus3) make the balls, chill for about 15 minutes then dip in the chocolate. Its a good alternative for people who do not like cream cheese and they are awesome too! While these were delicious and quite the hit, they were kind of a pain, to be honest. I chilled the dough before rolling it into balls, but it still melted when I rolled them in my palms. Any suggestions on how to handle this? I will make them again, but would love to have a less-messy way of doing it. Thanks for the comment Dawn, I’m glad you liked them! I don’t remember them being quite so messy, but maybe I’m blocking it out of my mind. My best suggestion is just roll them quickly and refrigerate in the middle if you think the dough needs it. I do have one question, how “crushed” do the Oreos have to be? Are they supposed to be a little chunky or very fine? I just want to know what the intended outcome is supposed to be. Do you mean how long they’ll be good for in the fridge? I’d guess about 2 weeks. My mom keeps them for a long time and we’ve never had any problems. I’d plan on keep them about as long as you’d keep cream cheese in your fridge. I made these with the new WhoNu Chocolate Sandwich Cookies and Low-Fat Cream Cheese. If you haven’t tried these cookies, you should….just like Oreos, but full of vitamins. I got them at Kroger, but I’m sure they are available at most grocery stores and online. Next time I think I would coat with dark chocolate to make them even “healthier”….and maybe add a little Bailys or Kaluha to the filling to make them even yummier!! OMG!!!! I made these but used the golden Oreo’s with strawberry cream cheese and covered with white chocolate drizzled with pink strawberry flavored chocolate!!! Now going to try with lemon Oreo’s and regular cream cheese!!! Hi Megan! I’m wondering if you tempered the chocolate or anything like that or just used good quality chocolate? I’m just worried they’ll come out dull/streaky. Thanks! 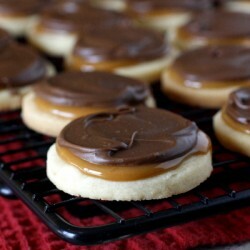 I generally use the chocolate melting discs you get at the grocery store or michaels, so no need to temper. If you use regular chocolate though, it’s probably a good idea. Hi Megan! I was wondering how many packs of the melting chocolate discs from Michael’s you’d recommend getting? Or just how many ounces of melting chocolate to pick up? You might be OK with one package of melting discs, but I would buy 2 just in case. I usually buy a chocolate one and a white chocolate/vanilla one and do half and half, which is why I’m not positive how far one package will go. I have a package of oreos in my pantry (of course haha) right now (double stuffed) and the weight is 15.35 oz. I’m not sure if the non-double stuffed ones would be that exact weight, but it should be close. Hope that helps!